Back in 2013 I reviewed the Redington Butter Stick. To see that review, click here. In the 5 years that have passed, they’ve made some nice improvements that I’ll mention during this review. 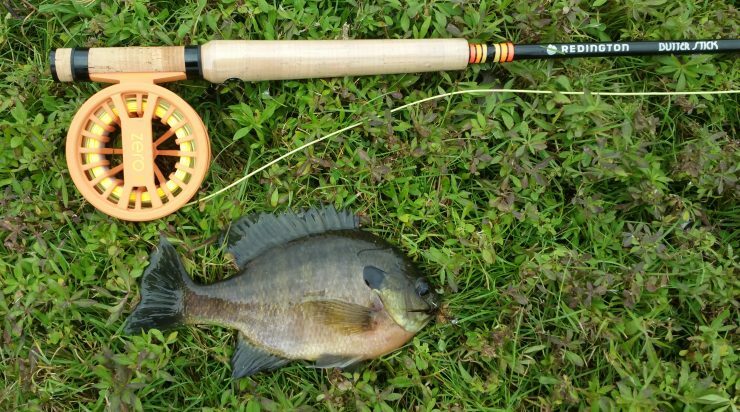 I’ve always been a fan of fiberglass rods, especially for kayak fishing and small streams, so I was very interested to see what updates they would make to a pretty solid offering. Last time I worked with a 3wt. This time I went with a 4wt for better distance casting and a little more backbone. The 4wt kept the flexibility that I expect from a Butter Stick. One of the first things I noticed is that the rod has a new look. I would call it retro, since it reminds me of some of my barn finds. That said, the quality of the blank, guide wraps, grip and reel seat reflect the benefits of modern technology and quality control. It’s a good looking, well made stick. 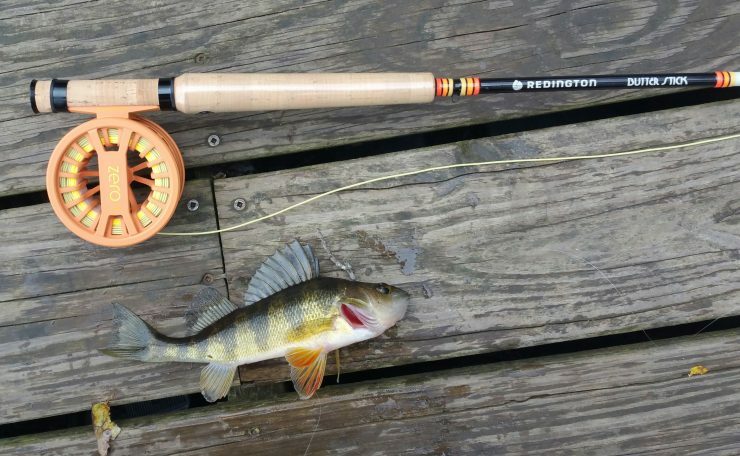 For this test, we paired the rod with a Redington ZERO Reel and RIO Gold fly line. If you’ve read my other reviews, you know I am a big fan of RIO lines. The Gold line is no exception. 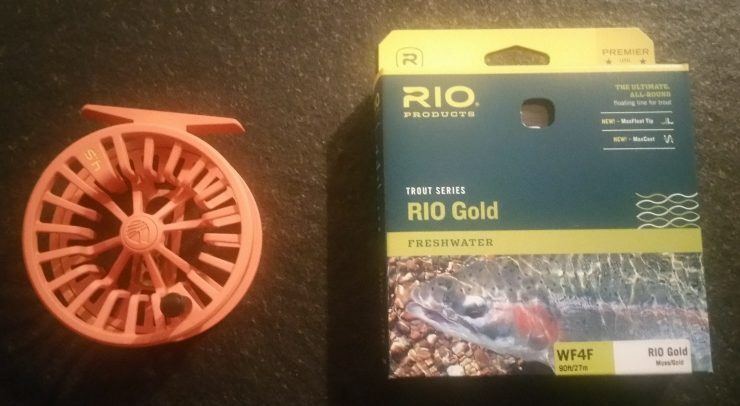 The RIO Gold product sheet says that it has incredible loop stability, a unique taper that easily loads fly line at close range and perfect presentation of flies between sizes #22 and #2. I would agree with these statements, and add that the overall quality is in line with other RIO products. The ZERO reel is light for a large arbor reel, and the click system is smooth and easy to use. The Dreamcicle Orange color is an added benefit and compliments the colors of the Butter Stick. I started by taking the Butter Stick to the local paddling lake, my go-to for rod testing. It allows me to cast from different perspectives. 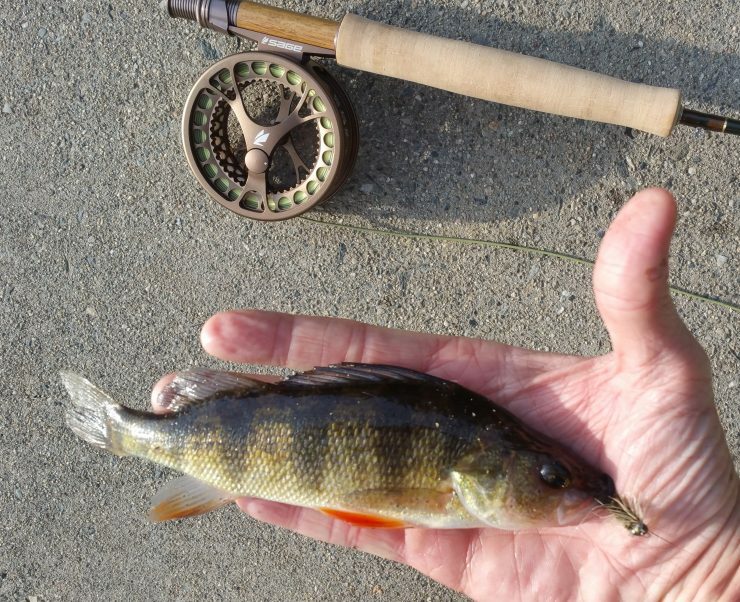 The wind kept me from staying long, but using a thin mint woolly bugger, I caught this perch. Next stop was a nearby farm pond. The winds subsided, and I proceeded to pick up a string of these. The Butter Stick’s sensitivity allowed me to detect the subtle takes. What I noticed about the new Butter Stick is that it has the backbone to bring a fish to the net quickly, while delivering the soft presentation you’ve come to expect, even when chucking streamers. Distance casting is solid and straight for a fiberglass rod, yet it still has that familiar waggle. The ZERO reel complements the Butter Stick, both functionally and aesthetically. It’s light and effortless to retrieve. I did give it a chance to play a fish and it was happy to see how smoothly it performed. I attribute some of the softness of delivery directly to the RIO Gold line. The quality and performance of these lines is undeniable. The bottom line: If you’re a fiberglass rod enthusiast, or are looking to add glass to your collection, the Butter Stick is a great choice. I thought it would be hard to improve on the original Butter Stick, but Redington has done it. I’m not the only fan of the Butter Stick. Check out the reviews below. As I finish this post, I realize that it will probably be my last of 2018. Hope this year was a good one for you, both on and off the water. Merry Christmas and Happy Holidays to you and yours. All the best in 2019! I’m always excited to see a package on the doorstep with a return address from Sage and RIO. It usually has some of the latest products inside and an offer to test them. I was pleasantly surprised to open this box and find a new Sage Dart 3wt rod, Sage Click reel and RIO Creek fly line. Ever since I saw the Dart I’ve been wanting to give it a try, and the timing couldn’t be better. I live in New England. The recent rains have pushed some of the larger rivers to relatively high water levels, and small streams have been looking more attractive. The Sage Dart is a great choice for small streams. I am testing the 3-piece 7’6″ 3wt. If you’ve read any of my prior reviews, you know that I typically test the product outside the intended use. This review is no exception. While I used it for small stream trout, it was also tested on my local bass pond. 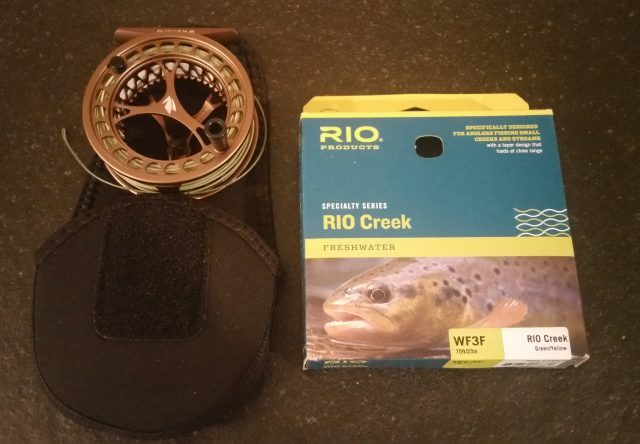 To complement the Dart, I received a Sage Click reel along with RIO Creek line, which is specifically made for small streams. 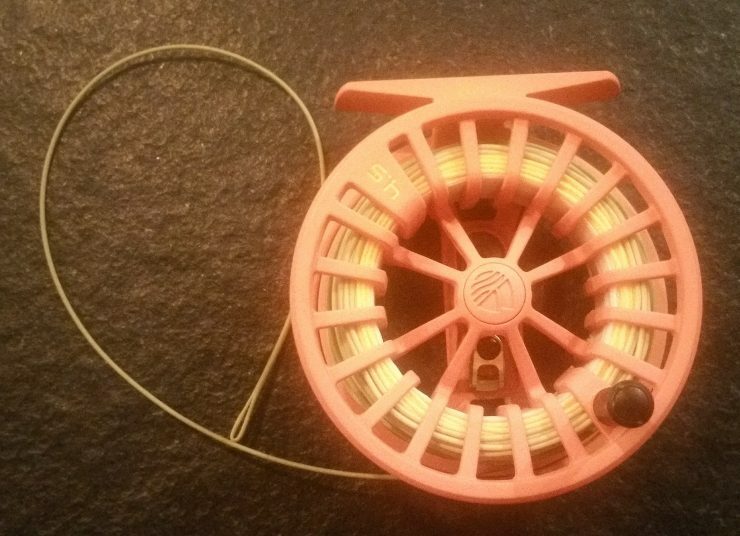 Sage reels are always light and dependable, and I’ve been using RIO lines for some time. 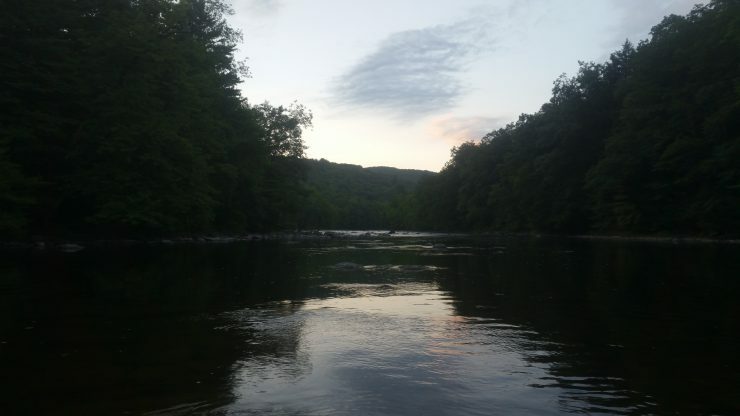 The first day of testing began on the Farmington River. 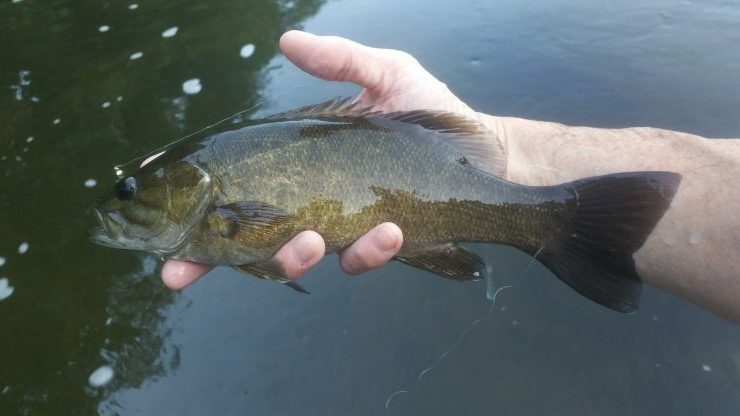 Almost immediately I caught a juvenile smallmouth on a nymph. 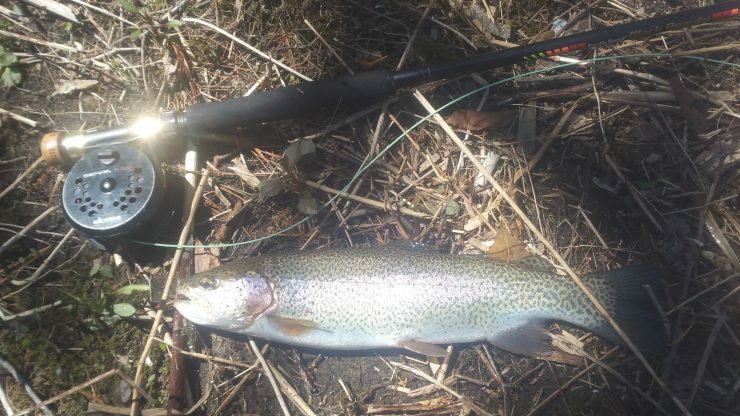 It was good to feel a fish on the line, but the winds picked up and I wanted to use this rod for what it was intended for – dry flies and small streams. We packed up and I started thinking about where to go next. Five minutes from my house is a small stream that runs thru town. It is stocked lightly in the spring, but by late summer holds few remaining trout and it is mostly dominated by panfish. It was a longshot, but turned out to be the right decision. I tied on a small caddis dry and started catching panfish. Nothing of size, but it gave me the opportunity to cast to different targets. I’m pleasantly surprised by the distance and accuracy you get from the 7’6″ 3wt Dart. For such a light rod, it shot much more line than I expected. 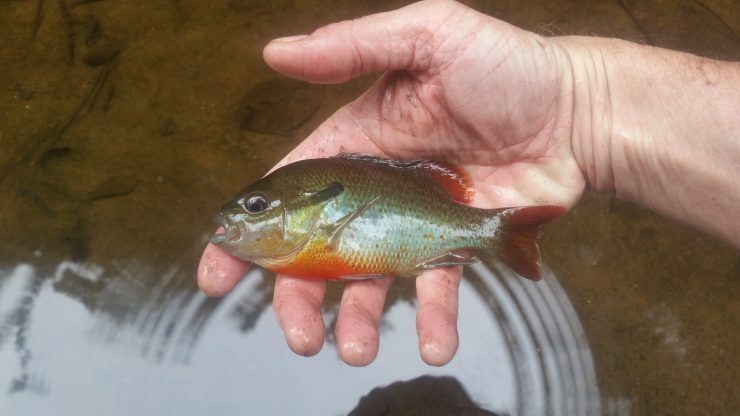 The RIO Creek line delivered the fly softly to the surface and did not spook the other fish. On one cast I had an interested follower that looked like it might be a trout, but it quickly turned away. I dropped down to a size 2o midge, and this brown appeared. As is typical, he refused the fly 3 times before turning and crushing it on the surface. The second outing I took the Dart to a local bass pond. It was a beautiful fall day and I decided to tie on a size 10 baby complex twist bugger from Fly Fish Food. I cast from the dock into the glassy water. Within minutes I had this perch on the line. Followed by this juvenile largemouth bass. Even though the Dart is a 3wt, it provided enough backbone to cast a size 10 streamer 60 ft, and pull in this bass with no issue. Again, I really like the smoothness and distance of cast with the RIO line. The bottom line: If you’re a small stream enthusiast, give the Sage Dart a test. It is an excellent dry fly rod, and worked well with small nymphs and streamers. Link to the RIO Creek line video. Note: I received a Sage Dart rod, Sage Click reel and RIO Creek line to test, but no compensation for this review. The opinions expressed in this post are my own. It was supposed to be raining. So imagine my surprise when Good Friday turned out to be a blue sky day, with temps in the 60’s. 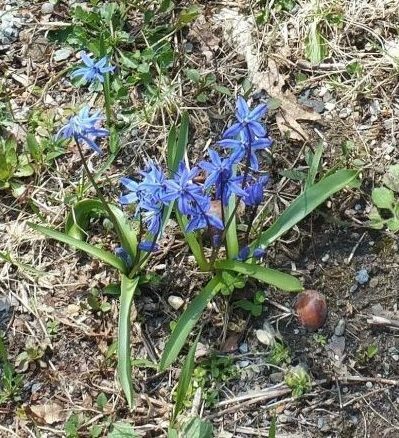 Spring had finally arrived in Connecticut. Errands kept me busy for most of the morning, but my plan was to spend the day chasing my first trout of 2017. Recent work and personal commitments left me with little free time. I am way overdue for some time on the water. The real decision was where to go. The Housatonic is still too high, and the Farmington would be undoubtedly busy, so I chose the Naugatuck. The Naugatuck is located between the two larger, more well known rivers. It is easily accessible and typically has lower traffic. 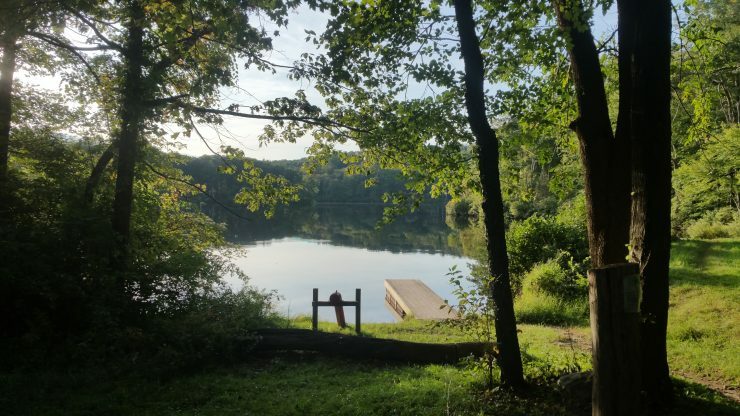 Like other Connecticut rivers, it has a history of abuse. 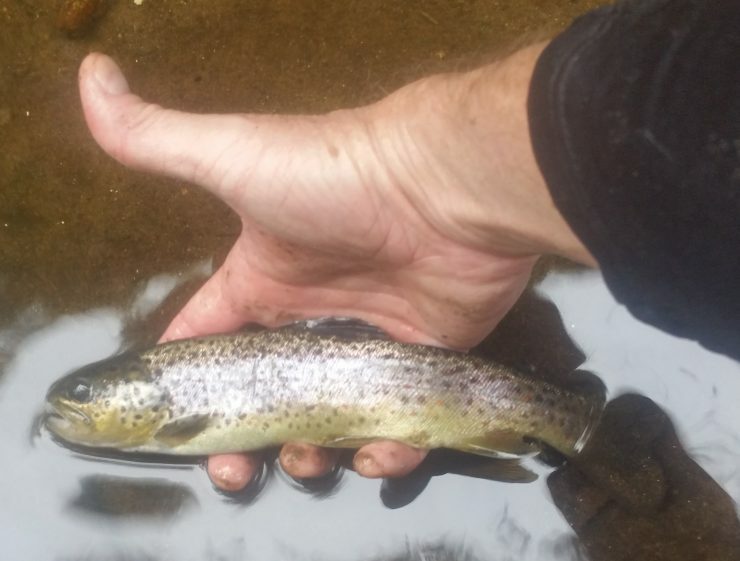 Today it is healthy enough to hold trout, at least through the spring. For a brief history of the Naugatuck River, click here. 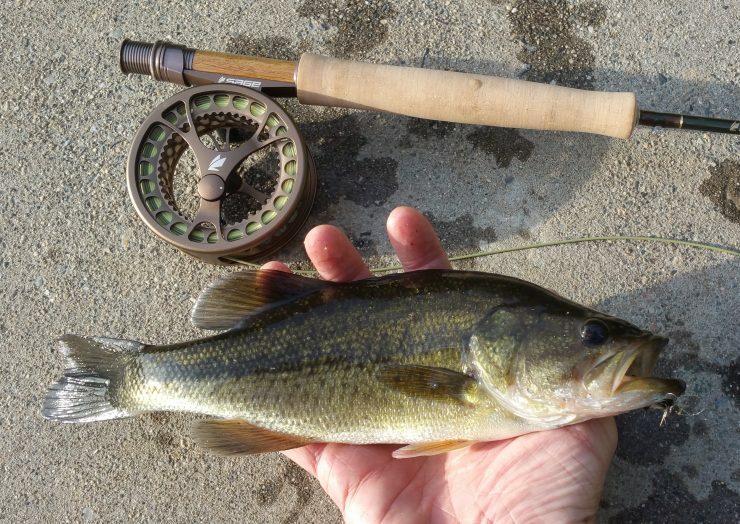 This morning I decided to fish one of my barn find fly rods, an 8′ 6″ South Bend Black Beauty. The label says graphite, but it looks and fishes like glass. 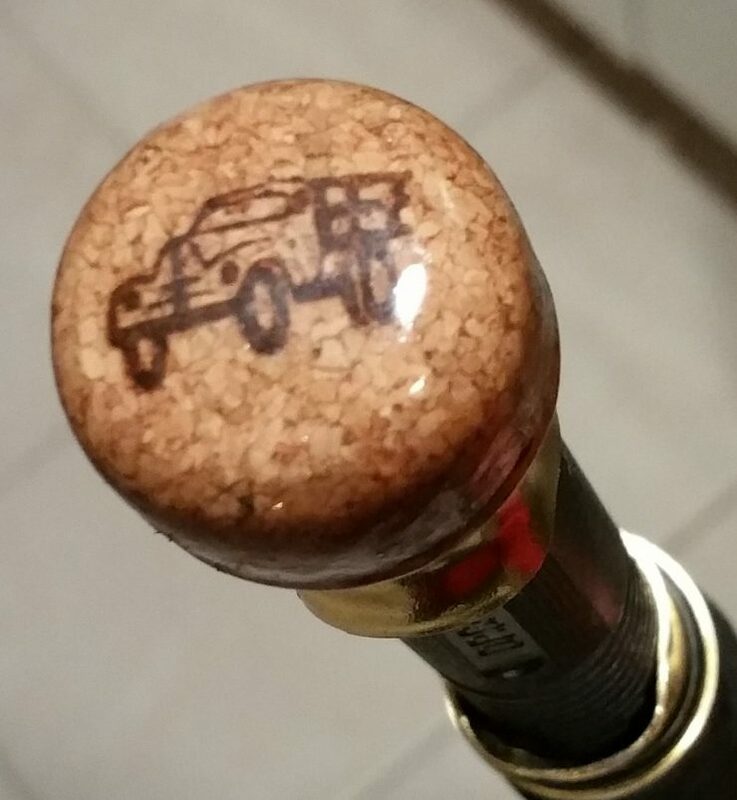 The end cap was missing when I got it, so I replaced it with a champagne-style cork pulled from a bottle of Red Truck wine, a favorite of the rod’s last owner. Complete with foam rubber grip and plastic seat, it is probably worth less than the PVC rod tube where it is stored. Arriving at the river, I parked downstream of the area that is normally stocked. It was surprising to find one angler in my desired spot fishing wet flies. I walked a distance downstream and waded in. Within a few minutes he left, so I quickly moved upstream. Nothing was rising so I tied on a woolly bugger and began to search for a tug, hoping to find a meat-hungry trout. After about a half dozen casts, I knew I was right. 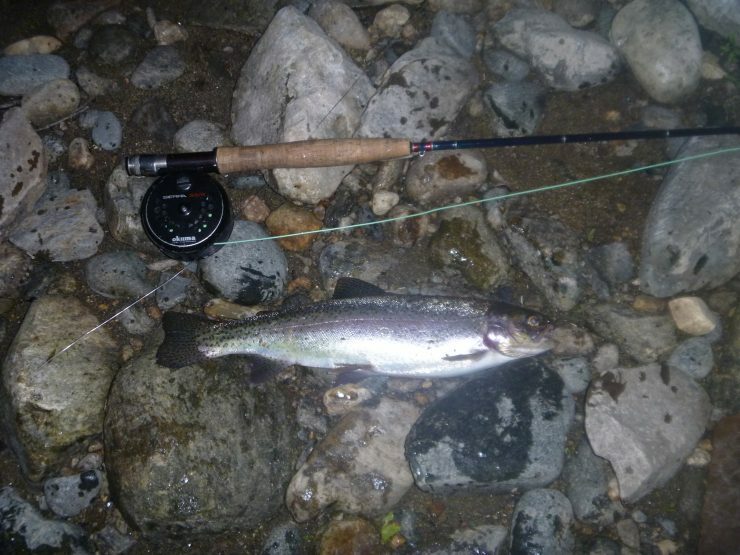 The rainbow below eagerly devoured the streamer, put a healthy bend in the rod and peeled off line 3 times before permitting me to land it in the net. A few more strips in the area yielded nothing, so I switched to nymphs unsuccessfully. I tried a few other spots, but was unable to land another one. After an hour I packed up my gear and headed off for a hike, happy that the catch of the day made it a Good Friday. Happy Easter to All. Enjoy! Or at least it seemed that way. 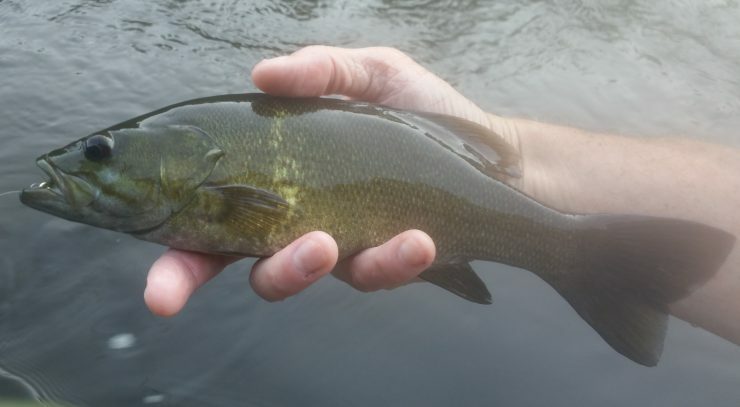 With temps still in the 80’s, I decided to give the trout a break and focus on Housatonic smallies with streamers. I was not disappointed. The bite was on from the minute I arrived. Often they were hitting the streamer as soon as it touched the water, acting like it was a dry fly. This continued for 2 hours, and I stopped counting at 30 fish. Why not give the green trout a try. Sometimes turning right or left makes all the difference. In this case it was a left. I pulled off the main road on to a cul de sac side street. A gas station, multifamily homes and a two-story commercial building lined the sides of the well-traveled path. A half mile downstream is a TMA, regularly stocked and easy to wade. But today I chose to seek out some new water. Driving into the empty parking lot of the commercial building I noticed that the river was less than fifty feet away. Well shaded by the old oaks along its banks, it was thirty feet wide at best, with clear, lightly stained water. With some effort I could probably find spots that were knee deep, but the run I focused on was directly behind the building, sixty feet or so in length, with good flow and only ankle-deep at best. Within a couple minutes of standing in the lot, rises appeared. It was after 7 pm, so sulphurs would be coming off soon. I walked to the head of the run and began casting a sulphur gnat I had tied the night before. 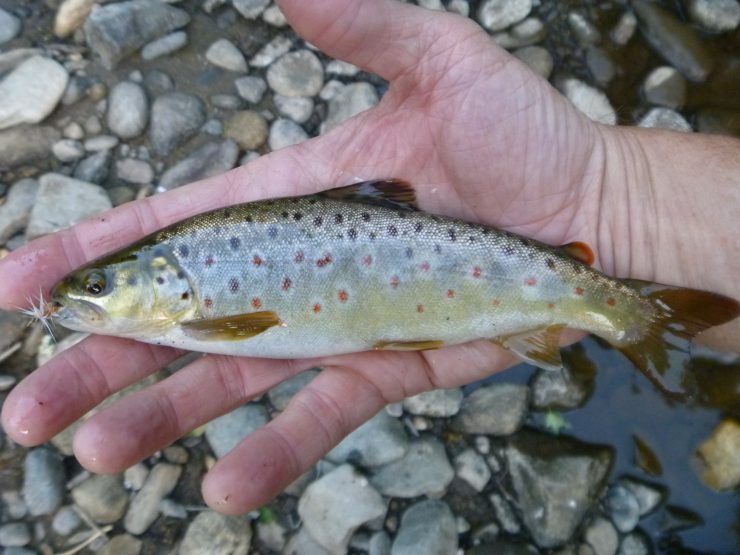 Within the first few casts I had this feisty little brown on the line. For those of you that tie, here is the fly I used. I really enjoy Jim Misiura’s videos and have made many of his patterns. I traveled upstream and found some slow-moving deeper water, but there were no rises. I tried streamers and nymphs with no luck. Again I returned to the ankle-deep pool. I switched to another sulphur pattern and shortly felt a strong tug on the line. I thought this was mainly a small wild trout stream, so I was surprised to find this 14″ rainbow giving me a fight in the shallow water. As the last remaining glimpse of sunlight left the surface of the stream, I packed up my gear and headed back to the car, happy to have found some new water, and knowing there are more trout to be had in an ankle-deep pool. Hope you’re getting out to find some new water. Enjoy!